Dr. Martin F. Land, professor of fixed prosthodontics at the Southern Illinois University School of Dental Medicine (SIU SDM), was awarded the George M. Moulton Award for outstanding achievement in the Art and Science of Fixed Prosthodontics at the 66th Annual Scientific Session of the American Academy of Fixed Prosthodontics in Chicago. 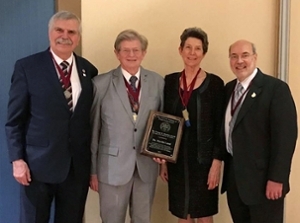 The prestigious award is the highest honor bestowed by the Academy and recognizes members who have made a significant impact and contributions to the art and science of fixed prosthodontics and have demonstrated lifetime service to the field. Dr. Moulton, one of the visionary founders of the Academy, its first secretary and sixth president, was the first recipient of the award in 1992. In addition to his service to the Academy, his contributions include serving as chair of the Section of Fixed Prosthodontics of the American Association of Dental Schools, president of Omicron Kappa Upsilon, Nu Xi Chapter, board member and president of the John F. Johnston Society for the Advancement of Prosthodontics, and board member, parliamentarian, and 2008 president of the American Academy of Fixed Prosthodontics. Land earned his initial dental degree in 1975 from Rijks University Utrecht in The Netherlands. He served as an assistant professor of fixed prosthodontics and occlusion from the University of Florida in Gainesville from 1978-1982. Before arriving in Alton, he was appointed director of postgraduate prosthodontics specialty training in 1982 at Loyola University Chicago School of Dentistry and then named chair of fixed prosthodontics in 1983. Photo (L-R): Dr. Stephen F. Rosenstiel, professor emeritus at The Ohio State University and AAFP Secretary, Dr. Martin Land, Dr. Jane Brewer, chair of restorative dentistry at the University of Buffalo School of Dental Medicine SUNY and Moulton committee chair, Dr. Gerry Santulli, chief of prosthodontics at Pentagon Tri-Service Dental Clinic and 2017 AAFP President.